These architectures are appealing because they function well in asynchronous environments. These APIs do not have to wait for realtime communication since they can trigger certain actions on event delivery. This frees resources by reducing (or eliminating) the need to constantly poll endpoints. 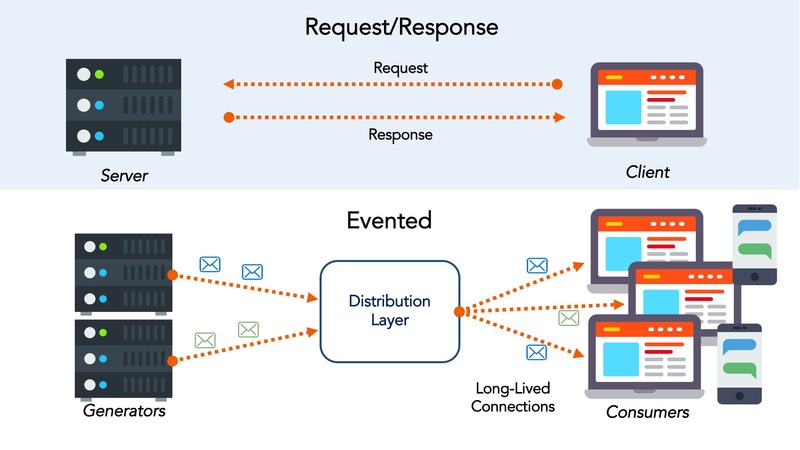 Because event-driven systems are more normalized to asynchronous (and often unpredictable) environments, they can become more responsive than traditional API architectures. This is because services can be activated by triggers fired on incoming events, which is useful even when the payload does not come with explicit instructions. Event Generator – pushes an event to a consumer when the generator detects a relevant state change. Event Consumers – consumes and acts on the events produced by generators. Event Channel – a mechanism whereby the information from an event generator is transferred to the event engine. Event Processing Engine – an event is processed and a subsequent action is taken. Downstream Event-Driven Activity – the downstream consequences triggered by the event-driven action.